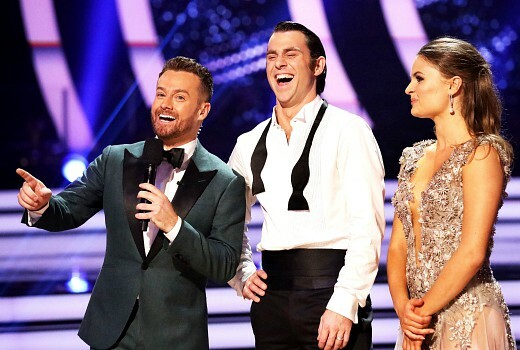 Dancing with the Stars will be without Grant Denyer tonight following an injury to his back. Denyer was absent this morning on the 2DayFM breakfast show with Ed Kavalee and Ash London. His manager sent an SMS to the team to indicate his injury resulted from swinging a sledgehammer on his farm. After spending the night in hospital he is now at home recovering. Denyer previously suffered a suffered a compressed fracture of the lower vertebrae during a motorsports event in 2008. In 2012 he dropped out of a Bathurst event due to chronic back pain. The Gold Logie winner has recently been working on a gruelling schedule of breakfast radio, Dancing with the Stars and Celebrity Name Game. DWTS production for hosts entails a Sunday meeting and a full day of Monday rehearsals and show. Amanda Keller will host solo tonight. 10 will be happier if Denyer hires someone to swing a sledgehammer in future. Oh, I so know his pain…. he needs to be a tad more careful…all the best to him. I see that.. but I can only advise what I was told.